If you believe the news, campaign spending is: Crazy! Incredible! Out of control! Bizarre and absurd! Record shattering! Are the sensational headlines true? Are today’s election campaigns really spending so much more than campaigns from years past? The Federal Election Commission maintains detailed campaign financials going back several years, so let’s take a look and see whether the data agrees. Here are the raw spending numbers for both parties’ presidential candidates since 1960 (the same numbers as the chart at the top). These figures are not adjusted for inflation. 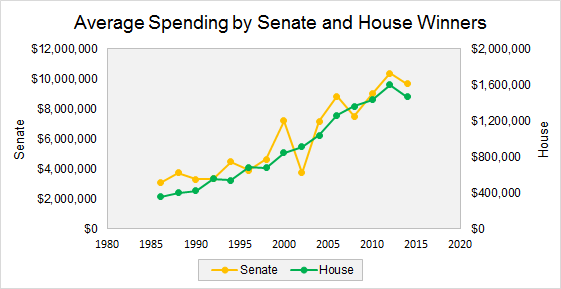 This next chart shows the average amount spent by Senate and House winners since 1985. The trend is increasing, but since these numbers do not adjust for inflation, or anything else, the trend doesn’t mean a whole lot. When you do account for inflation, the trend is still upward, as shown in this chart from CNN. 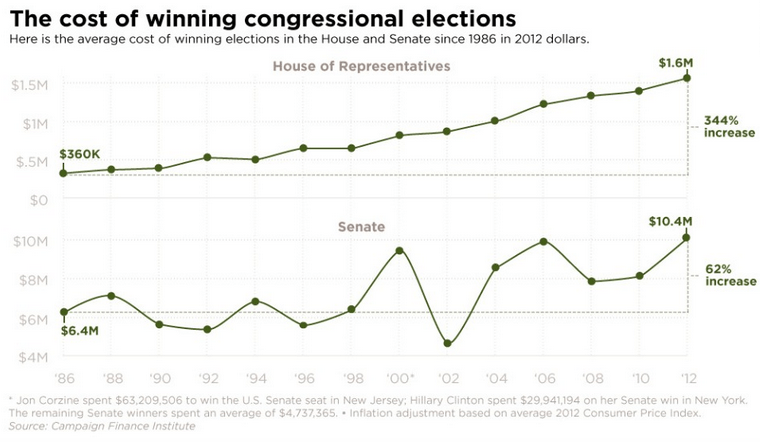 It would be easy to stop here and conclude that campaign spending is higher than ever before. This conclusion would be incorrect. Not only has the value of a dollar changed over time, the size of the population has also changed. More people = more donors. Household incomes have also increased, so the average person spends more today than they did in 1960. More income to spend = more income to donate. In the charts below, the campaign spending is normalized to 2014 by adjusting for all three factors: inflation, population, and income/spending (methods explained below). Here is how Senate / House spending looks after applying these three adjustments. For House and Senate races, the historical trend is flat. When you remove the effects of inflation, rising population, and rising incomes, House and Senate campaigns are spending about as much today as they did in 1985. Here is the presidential campaign spending chart, after applying the same adjustments. Now looking at the numbers apples-to-apples, you can see one of the biggest spenders was Nixon in 1972. Nixon also went on to lose his job for raising that money illegally (yes, Watergate was a fundraising scandal). So we should ignore the spike in 1972. Between 1960 and 2000, presidential campaign spending actually trends slightly downward. But after 2000, something changed. 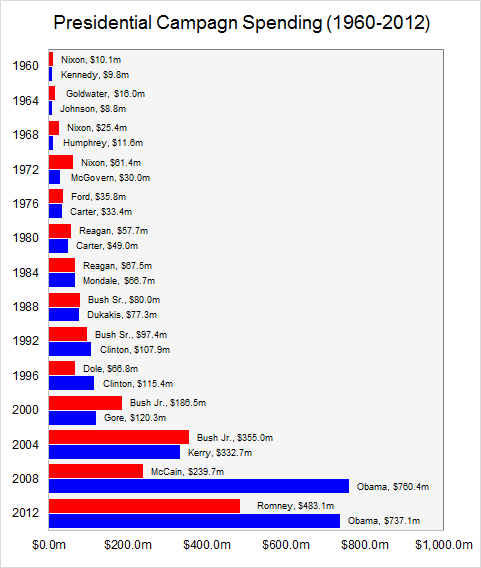 Since 2000, presidential campaign spending has shot through the roof! And these numbers do not even include spending by super PACs, which would make the numbers even more exaggerated. Why has presidential campaign spending increased by so much in the last 15 years while Senate and Congressional spending has stayed the same? Maybe it says more about post-9/11 executive power than it does about the rules of campaign finance. Here is an updated chart that includes near-final 2016 campaign spending (as of last Monday, 11/7/16). Previous Article The Single Largest Tax on Poor Families: the Lottery? Based on the top chart, it certainly does seem to be true that whomever spends the most, wins the presidential election…sadly and strangely enough. Yes it does. Wonder how much of that is “cause” and how much is “effect.” — more money increases chances of being elected / higher chance of being elected increases dobations. What else can you expect from a Capitalist Democracy! He who risks more wins more! These campaign spending are so enormous, why can’t these same senators and congressmen or presidents raise money for a particular cause such as fixing the Michigan water pipes replacement which probably cost much less than what Hillary spent for her campaign in 2016. Even billionaires are willing to spend redoing national monuments but not to fix water problems for common Americans. What a farce of democratic values! Sorry, but I’m calling BS on your “normalization.” $10m in 1960 is not $800m in 2012 (or est $1200m in 2016). It is not close; and it is not reasonable to adjust for purchasing power or GDP/capita or whatever the hell that third deflator you picked is. You don’t compare apples and oranges by spray-painting the friggin’ oranges. I get why rising population increases cost – especially with direct mail, but why does rising income? You can raise more but you already accounted for inflation for the cost…. But you don’t have to spend it…?